A very handsome pair of 1950s lounge chairs by Harvey Probber, with wood frames stained dark brown, and new upholstery in a beige and brown chenille. Great Classic modern design, and with original labels. A popular designer who had his heyday from the late 1940s into the 1970s, Harvey Probber is one of the post-war American creative spirits whose work has been recently rediscovered by collectors. His designs are by-and-large simple and elegant, but his signal achievement was to pioneer one of the key innovations of mid-20th century furniture: sectional, or modular, seating. Even as a teenager, the Brooklyn-born Probber was making sketches of furniture designs — and selling them to Manhattan furniture companies. He began working as a designer for an upholsterer once he finished high school and, apart from a few evening classes he took as an adult at the Pratt Institute, he was self-taught about design and furniture making. After wartime service — and a stint as a lounge singer — Probber founded his own company in the late 1940s. A lifelong familiarity with the needs of New York–apartment dwellers doubtless sparked his most noteworthy creation: a line of seating pieces in basic geometric shapes — wedges, squares, half-circles — that could be arranged and combined as needed. Modular furniture remained the core idea of Probber’s business throughout his career. As a self-trained designer, Probber was never wed to any particular aesthetic. He preferred simple lines for their inherent practicality, but often used hardware to enliven the look of his pieces, or added elements — such as a ceramic insert in the center of a round dining table — that was visually interesting and could serve as a trivet. He gravitated toward bright fabrics with attractive, touchable textures that might be satin-like or nubbly. Above all, Probber insisted that the products that came out of his Fall River, Massachusetts, factory be built to last. “The quality of aging gracefully,” Probber once told an interviewer, is “design's fourth dimension.” This quality he realized: Probber furniture is just as useful and alluring now as it was when made — and maybe even more stylish. 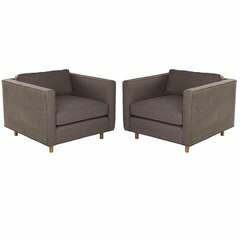 Harvey Probber lounge chairs, pair. Harvey Probber Inc. USA, circa 1950s. Upholstery, down feather cushions and walnut. Measures: 30 W x 30 D x 25 H inches. 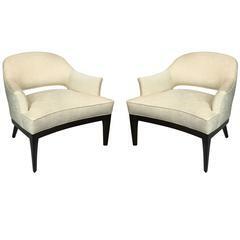 Pair of lounge chairs designed by Harvey Probber, circa 1950s. Sculptural mahogany framing fully restored. Newly upholstered in grey chenille. This is an absolutely fantastic pair of low lounge chairs. They are very sculptural in design. They rest upon chrome plinths. They retain their original tan wool weave fabric.